First nice thing I've tried to draw in a while. This is a race called the Kenku, for 4ed DnD. 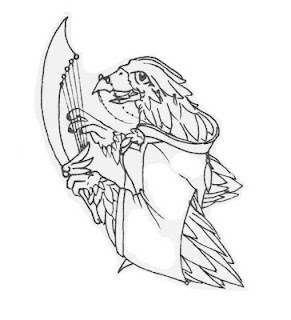 A friend of mine is running Thunderspire Labrynth for us and I'm a Kenku bard. Check out my sweet Harpitar! (songblade) Anyway there weren't many cool images to look at to get this right, but I think she turned out cute. I've got a full body finished and colored image at home, but no time to scan it. Perhaps later. Oh and stay tuned for images of my new project... the Socktopus! Just a small blurb on Kenku, they are from Japanese mythology and are (clearly) a race of humanoid birds.